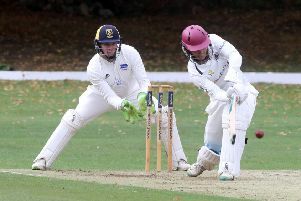 Bottom beat top in a high-scoring Division One thriller yesterday (June 4). Wisbech entertained Bourne looking to extend their winning run to six games while Bourne were looking for their first success of the season. And, after almost 90 overs of pulsating cricket, it was the basement boys who nicked it by four wickets. Wisbech batted first and amassed a cracking 262-7 with Parth Patel scoring 113 and Gary Freear 92. Bourne also had a century-maker in the form of Sam Evison. His 102 plus 56 from Peter Morgan and 40 from Jordan Temple saw the visitors to 267-6 with just over an over to go. Wisbech stay top, 20 points clear of Oundle, whose game against Market Deeping was abaandoned through rain. Hanno Kotze smashed 96 (nine fours and six sixes) for Oundle as they totalled 261-9 and Deeping were 100-1 off 17 overs in reply when the heavens opened. Josh Smith had made 50 not out. Ketton emerged comfortable winners over a depleted Peterborough Town side (Town firsts were involved in a National Club KO Cup match against Banbury). Town were bowled out for 125 with only Connor Parnell (82) getting to grips with the Ketton attack and Ketton reached 127-1 in 14.2 overs. Zeeshan Manzoor (72no) and Shakir Mahmood (42no) got most of Ketton’s runs. In the other Division One game played Stamford (232-6) beat Nassington (142 all out) by 90 runs.